To check if your beacons are transmitting signal you will need to do a couple of basic checks before you can dwell into the specifics. Firstly, check if the batteries have been inserted into the beacons and they are powered on. You can follow the start up instructions to achieve this. Depending on the kind of beacon you have these instructions vary: indoor, pocket, keychain, and outdoor. Once you are certain that the beacons are powered on you need to test if they are active and broadcasting. For this, you need to use the Beaconstac app (available for iOS and Android). All active beacons will appear at the top of the list under My Beacons section of the app. Note that you will able to see the signal strength (in dBm) of these beacons. 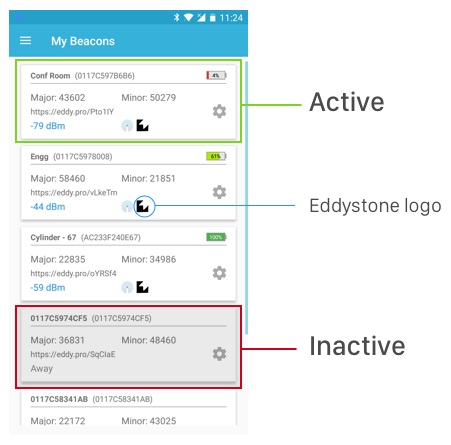 Further, the eddystone logo that appears next to the range indicates that eddystone data is being transmitted by the beacon. If all the above criteria are met you can be sure that your beacons are correctly transmitting data. If not check out this article to take steps to turn on the beacon or replace batteries if needed.